Could 'iPhone Air' herald final surge of Peak Apple? Pics The days of 2014 haven’t even clocked up double figures yet and already the iPhone 6 rumour mill is grinding out more purported sightings of Apple’s next iOS handset design. This time we get to gaze upon blurry metal chassis images, apparently courtesy of Chinese site CTech, (C科技). Yet following this supposed leak, all and sundry in China have slapped their own logo on these pics, so the original source isn’t exactly clear. Still, if we first take these photos with a bag of salt and then ponder on what’s actually shaping up here, it looks like Apple is aiming for an iPhone Air with this slimmer form factor. 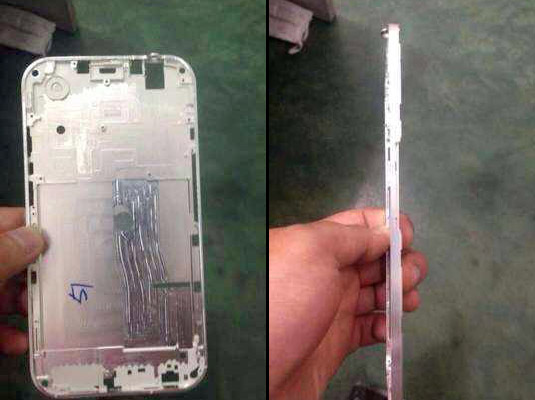 If existing rumours are to be believed, that will shave the current iPhone 5s down from 7.6mm to around 6mm. The guessing games continue with the screen size measuring up at anything from 4.7in to 5.7in. The latter would put Apple in the phablet league for the first time and the larger area would allow for a thinner battery, spread over a wider area.